Like Christmas, Valentine’s Day only happens once a year. While normally we would let this day go by with nary a peep, we decided to shake things up a bit, and do something a little different. We’re calling it: Wear the Love, Share the Love. 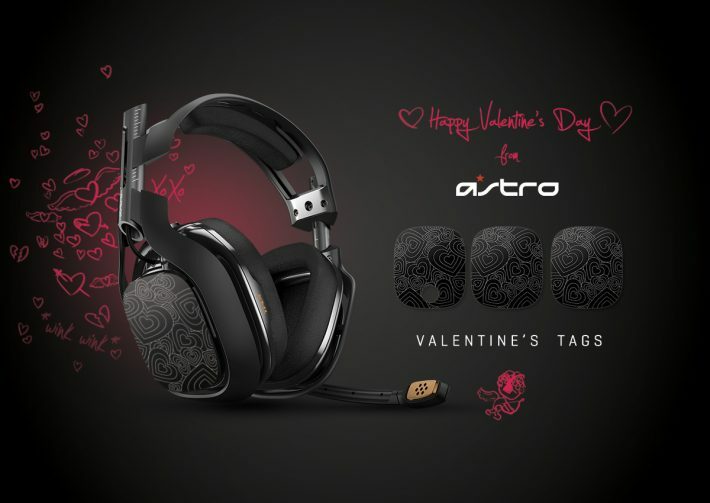 Way back in 2011 the ASTRO Gaming Crew released a special limited edition version of A30s with Valentine’s Day heart Speaker Tags. While those Tags are long gone our graphic design team created special heart-themed A40 TR Speaker Tag art, based on the original A30 Speaker Tags, as part of our way of giving back to the ASTRO family. While you can’t go buy the tags directly on our website you can use our Speaker Tag Customizer to make your own A40 heart Speaker Tags for yourself or that special gamer in your life. 1. Download the tag art for free here. 2. Unzip the files and save locally on your PC. 3. Head over to our online Tag Customizer. 4. After you get started, click the Add Picture button. 5. From there, you can upload the downloaded art files. 6. For a step-by-step on how to upload and create the custom tags, check out our Speaker Tag Customizer Guide which will help ensure your new tags look great. We hope you like the free design as much as the ASTRO Crew does. Don’t forget to share your custom Speaker Tags on social media, and use the hashtag #ASTROfamily.